Southeast Dallas County native, Jess H. “Jack” Boles was born into a family of hardworking farmers in July of 1917. He was taught to value loyalty, be a man of integrity and treat everyone with respect. After graduating from Mesquite High School he began working as a carpenter at eighteen years old. He was involved in constructing the Hall of State at Fair Park, which was built for the 1936 Texas Centennial Exposition. After its completion, Jack Boles first worked as a valet parking attendant at the opening of the Texas Centennial Exposition on 2nd Avenue near Grand Ave. This began his parking experience that eventually included working in the Medical Arts Garage and the Biltmore Garage in Downtown Dallas. He worked and managed garage structures until he enlisted in the military. In 1943, he enlisted in the United States Marine Corps to serve in World War II. 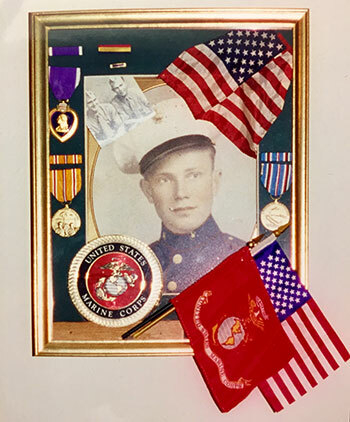 Known as one of the “Devil Dogs,” Jack was in the 1st Battalion, 2nd Marine Corps, B Company and deployed to the Pacific theater of World War II. Jack and his unit first fought at Tarawa or the Betio Atoll. His battalion landed at the infamous Red Beach. In the landing at Red Beach 85% of his company took casualty. Jack was then attached to the Naval Cross awarded Capt. Maxie Williams, and they continued to the take the airstrip, and then to Black Beach to defeat the remaining Japanese on the island. In his second conflict Jack was seriously wounded by mortar shrapnel in the famed Death Valley on Saipan. His “Marine buddy” carried Jack on his shoulders, so he could receive lifesaving medical care for his injuries. The Wounded Warrior logo that today is significantly recognized is an exact picture of his buddy, carrying him to the mobile medical station. Jack Boles endured the remainder of his life with shrapnel and bullet fragments lodged in his pelvis and hip. Jack was a twice-decorated war veteran who was awarded the Purple Heart for wounds sustained in combat. One of Jack’s and his marine buddies’ proudest moments was when Admiral Chester Nimitz and Marine General “Boomer” Smith recognized their campaign ribbons. They requested to sit and eat lunch with them discussing the battles and the war. After returning home to Dallas after the war Jack began valet parking for and managing the Biltmore Garage for Mr. Bill Sailer who was a member of Brook Hollow Golf Club. Bill Sailer encouraged Jack to come work for Sunday dinners at the golf club. In 1946, Jack Boles Parking was born when the club members and management requested him to park events at the club. The members were very pleased by the service his parking team provided, so Jack and his friends started parking part-time at Brook Hollow Golf Club; and at many of its members’ events at their private homes. Most of Jack’s early employees were servicemen who served in World War II. The Dallas business and social society considered and respected these men as heroes. Our founder also managed the parking for the Braniff Jet Rail at Love Field for Earl Hayes in the 1960’s.